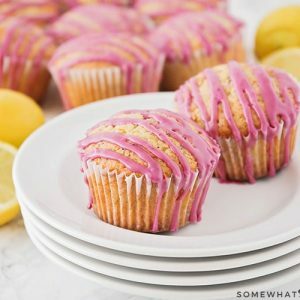 These Lemon Poppyseed Muffins are light, fluffy and perfectly sweet! They have just the right amount of tartness from the lemon zest and the blueberry glaze will knock your socks off! Preheat the oven to 350, and line muffin tins with liners. In a medium bowl, combine the flour, poppy seeds, baking powder, baking soda and salt. In a mixing bowl, cream together the butter and sugar until fluffy. Beat in the eggs one a at time, mixing well after each addition. Mix in the lemon zest and vanilla. With the mixer running at low speed, add in the dry ingredients in two additions alternating with the yogurt, beating until just incorporated. Fill muffin pans two-thirds full. Bake for 18 to 20 minutes. Let cool for 5 to 10 minutes in the pan, then transfer to a wire rack. Mash the thawed berries in a medium-sized bowl to release lots of juice. Remove the blueberry skins from the juice and discard. Add the vanilla, milk, and lemon juice; then add the powdered sugar, whisking to combine. Drizzle glaze over completely cooled muffins and allow to set for 20 minutes prior to serving.